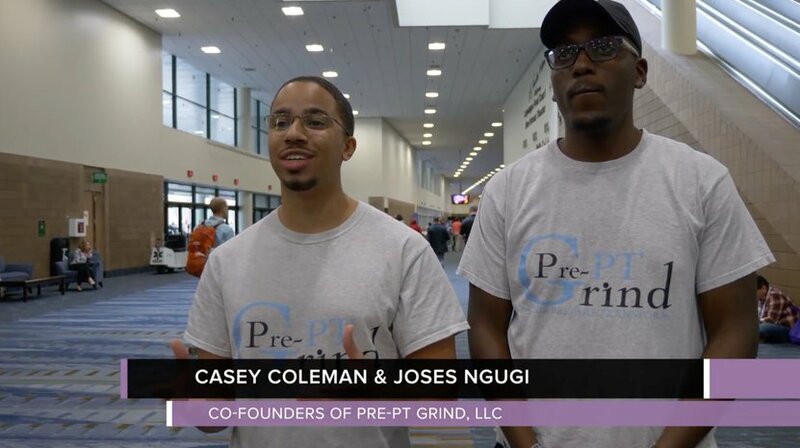 We had the opportunity to talk with Casey Coleman, 3rd year SPT and Joses Ngugi, DPT at the APTA Combined Sections Meeting and asked them to to share some thoughts on the goal and mission of Pre PT Grind, LLC, pre physical therapy students, and why pre PTs are so important to the future of physical therapy. At the surface, Pre PT Grind's goal is to help driven and passionate pre physical therapy students gain acceptance into physical therapy school without wasting time or money. However, at its core, their mission is much deeper than that. Pre PT Grind's mission is to actually prime pre PT students to take full ownership of physical therapy and ultimately take the profession to new heights. Whether you're a Student PT or a 30 year physical therapist, many Pre PTs can only dream of being in your very situation that you may take for granted everyday. Pre physical therapy students are hungry and passionate for a profession that many of us new grads and veterans do not appreciate anymore. The greatest the thing Pre PT Grind has given back to us as co-owners is gratitude. Gratitude for our patients, our knowledge, our skills, relationships, business opportunities, and our ability to help others who strive to be physical therapists. As always, the future of any company, organization, or profession, rests on the shoulders of its young, and physical therapy is no different. If the profession truly wants growth in every aspect, then it will most likely come from those who have a clean slate, fresh mind, and new perspective. If we as a profession want better legislation, better direct access, higher APTA membership, improved clinical decision making, increased reimbursement rates, improved patient outcomes. increased awareness of PT — the list goes on — it will most likely come from the pre PT students soon to join the profession. One of the biggest things we have to do to preserve the passion that pre PT students have for physical therapy is to remind them that there are no limits to what they can and want achieve. The only way the aforementioned growth is going to happen is if the fire your future colleagues are not stifled. Lastly, we should remember that it takes a village to raise a child, and with 240+ DPT programs in the USA, we have many many children. We should remember that they are watching us, and whatever we want them to emulate is what we should portray. By keeping that in mind, we would improve in every aspect of physical therapy, now and in the future.